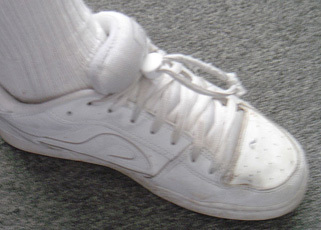 Okay, it may sound a bit petty, but I get frustrated when my shoelaces come untied - which they seem to do too often. 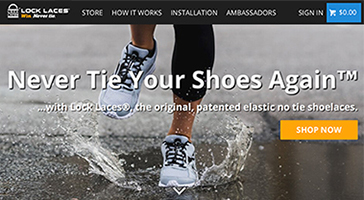 The original laces were waxed - how silly is that - to put a slick surface on an item that relies on friction to do its job. Even tennis shoelaces came untied. I bought a small bag to put all my stuff (wallet, membership card, iPod, etc) in to go to the gym. The bag came with a shoulder cord and a cordlock to secure the cord. I didn't need that cord nor the cordlock, so I cut it off. I was lying at a hotel swimming pool in Dallas playing with this excess cord when I made the connection that the two ends of the cord could be shoelaces and this cordlock could secure them. Back in the hotel room, I threaded the shoelaces through the cordlock and went out to eat. It worked great. The laces were secure, stayed 'tied' and it was very easy to push the release button on the cordlock and slide it tight or loose. The next morning I went to the Whole Earth Provision store in Dallas and bought several black cordlocks. 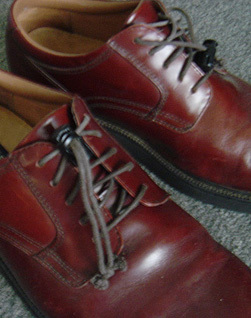 I put them on two pairs of shoes and continued the experiment to test the ease of use, security, and appearance. 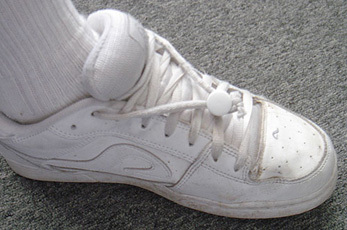 Tests were successful and I later ordered white cordlocks for use on tennis shoes. They are easy to install and easy to use. 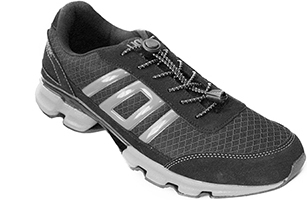 No-tie shoelaces can help athletes cut transition time, special children or seniors who live with disabilities, and anyone who wants convenience. Inspiration: Saturday, June 18, 2005. Search cord locks, shoe ties, or lock laces.